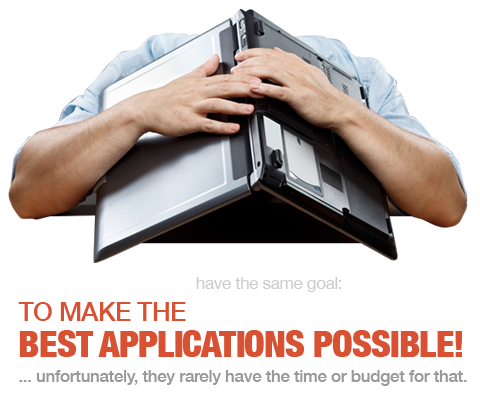 Accelerated Software Development is Surround's overarching strategy for developing software faster and better. Surround's Accelerated Software Development Strategy solves the biggest problem plaguing enterprise software development – software change. It is a comprehensive software development strategy that substantially accelerates the creation, modernization, delivery and maintenance of high-quality state-of-the-art software for companies of all sizes and industries. Whether building new software, adding new functionality to existing software, or modernizing legacy applications, with Accelerated Software Development your developers can develop faster, with better results, and more functionality. They'll build the software you need at a cost that makes sense and in the time frame needed, delivering the software your employees, customers, business partners, and vendors will love. Surround has high levels of expectation for the software that we develop and have identified thousands of attributes that define these expectations. And, while they have changed and matured over the years and have been adapted to various technologies, the guiding principles, categorized into what we now call the "7 Pillars to Accelerated Software Development", have remained tried and true. Primary Pillars — These are the essential pillars that apply to almost all software development no matter the type, no matter the size. Extended Pillars — These pillars are geared to meeting specific needs in the business of software development. We have very complex business requirements and processes and we were struggling with how best to design that as well as having to understand how best to write the software.  Accelerator provided us with an incredible software foundation as well as a defined methodology and standards for development. We were able to finally focus on the business needs. But the huge contribution to the success of the website is that the customer uses it; therefore, the new approach which focuses on a customer-centric business model that will ensure the loyal return of a user to the website and leverage our marketing & technological prowess. We chose Surround because they demonstrated they were in tune with ease of use and customer interfaces more than anyone else we evaluated. The Rise of Accelerated Software Development and Developing Smarter. Truly effective software development doesn't happen by chance. Surround's Accelerated Software development strategy is the culmination of years of developing and from taking a holistic approach to identifying and solving the key problems associated with software development. This is something that has changed and matured over the years and, of course, will continue to do so as technology changes and tools improve. To provide a solution you must first understand the problem and in all software development, including software modernization, there are two critical problems. 72% of all major software projects fail. It is the highest percentage of any industry. Only 16% of projects are completed on time and within budget. The top complaint by executives and users is software can't keep up with the business. The development and delivery of key applications simply isn’t keeping pace with the business needs and businesses aren’t progressing as fast as they could if these needs were met. Some common problems you may be hearing about your software. If you have heard any of these, you may want to have a closer look at how and what you're developing. Slows down the users workflow. Requires more work for users, rather than less. Hides system information through convoluted access or navigation. Is either overly complex and difficult to learn or is overly simplified and inefficient. Too easy to make mistakes. Is aggravating and frustrating to use. Some common problems you may be encountering in your software development. If you can relate to these, you may want to have a closer look at your development process. Long waits for requested changes. Significant project backlog and reduced delivery capacity. Lack of return and significant total cost of ownership (TCO). Changes are often high risk and disrupts business. Software from the dark ages. No ability to adapt to changing technology. Lack of application monitoring, management & control. Development tools are usually restrictive or incomplete. These problem are why productivity solutions for software engineers are so appealing and such a good idea. There are many on the market, yet too often they are restrictive or incomplete. The results you get are underwhelming and you spend extra time overcoming limitations, dead ends, and brick walls. Chances are you have tried some of these solutions. Perhaps even had some success with them. But, was that a tactical one-off solution or part of a long-term strategy? What you may have come to find is that the closer you look at and use these solutions, the more you find limitations. The solution only gets you so far and then BAM, a brick wall. And that brick wall can be very expensive to crash into – you may have to start all over, in fact some companies may be on their 2nd or 3rd attempt. You may work through and past that brick wall only to run into another and then another and another. Now you are even further down the rabbit hole feeling like you’re trapped and can never get out. 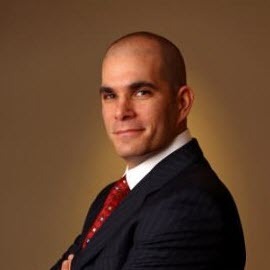 Solution providers may offer other parts of the product suites to get around or hacked through the wall, but there are additional license fees, different product parts may not play together well, what they have already done may not migrate to the newer solution, or there’s inevitably another brick wall. And, you are left standing on a bunch of tools, poor use of resources, wasted dollars, and further behind. Truth is, you need advanced automation that provides complete solutions. Including the ability to build mission critical enterprise applications, mobile applications, business processes, executive dashboards, superior user experiences, web services, workflow, flexible cloud-enabled architecture, and more. In essence, you need a way to reach your goals ahead of the competition with faster releases, better results, and more functionality. With Accelerated Software Development that’s exactly what you get. Now, your developers can Develop Faster, Develop Better, and Develop More. They can deliver, with 100% success rate, the software your employees, customers, business partners, and vendors will love. 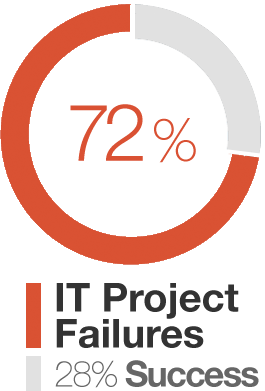 You will deliver software that makes doing business with you compelling, obvious, and easy. With Accelerated Software Development your team can focus on what’s most important: making better applications, doing it faster, with more comprehensive functionality, and an agile architecture. With it your software will exceed expectations all while staying under budget and within business time lines. On top of that you will gain processes for fast, quality, repeatable, and continual development so you can continue to improve and adapt your operations as time goes on. Keep up with the business. Whether building new software, adding new functionality to existing software or modernizing legacy applications, with Accelerated Software Development your applications can finally keep up with your business so you can stay ahead of the competition. Accelerated software development isn't rocket science. It just takes the proper direction, guidance, and understanding of what software development is really all about. Why? Understand why you are developing the software. We develop software to solve business problems. Period. If you don't understand the business problem, stop now and start there. Who? There are 4 primary groups in software development, (1) The Business Executives who invest in software to meet business needs, (2) The Users whose use of the software provides the return on investment, (3) The Developers that use the investment and deliver the software, and (4) The Providers who provide software and tools to decrease the investment needed, increase the return, or both. What? Know what needs to be built, the budgeted investment, and the expected return. Make sure they are well aligned. How? 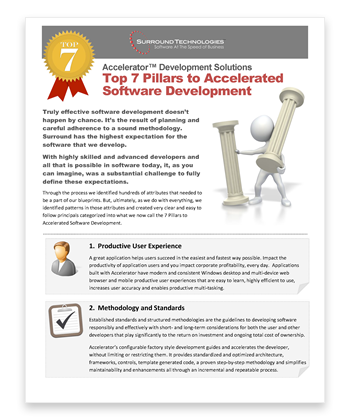 Develop based on the 7 Pillars to Accelerated Software Development. Get it done – results matter. 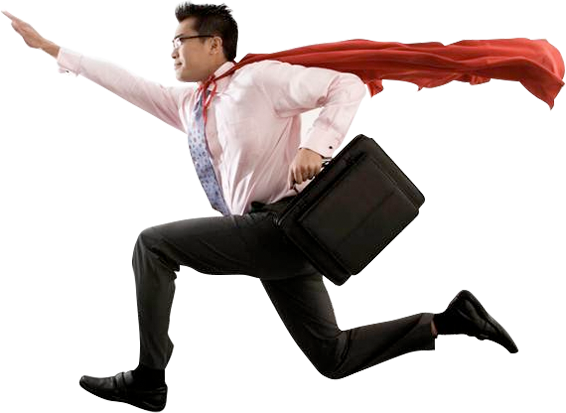 Software development has always been about the speed and quality of delivery. The results are what matter the most. That is what Surround focuses on. For us, software development is largely about creating a culture of high performance, and motivating and empowering people to achieve organizational goals and objectives. A culture that is rooted in the "Get it done - results matter" philosophy. Accelerated Software Development is that overarching strategy, our strategy of strategies, to do just that. Anyone involved with software development projects knows bringing them to successful completion can be so difficult to achieve. Unfortunately, they often cannot always pinpoint why. There are 6 key factors that impact how successful a software development project will be, if at all. Success for any project is dependent on effective management of risks, both early on and throughout the project's lifespan. Identifying, quantifying, addressing, and monitoring risk is crucial to project success. Project time frames may have varying degrees of impact on the expected return on investment. Some projects may have very hard deadlines with direct implications on costs and opportunities to capture the return, while others have soft flexible deadlines. Whether hard or soft, missing deadlines will increases risks, break budgets, require more resources, reduce quality, and drop functionality. It is critically important these deadlines are realistic and well understood by the team. Cost parameters directly influence the expected return on investment. Budgets should not be arbitrary or unreasonable, but should be as quantifiable as possible and encompass all aspects of the project that can have a monetary component. Thorough planning upfront assures that the budget is credible and leads to successful project. Determining and finding the necessary resources including time, money, skills, tools, and equipment can often be daunting, yet absolutely essential to a projects success. The quality, or degree of excellence, of the software will be the final test for getting the expected return. More than simply bug-free code, quality is about delivering on the defined scope and expectations of the project. Quality covers many areas of the software, such as usability, robustness, utility, beauty, security, performance, reliability, maintainability, and so much more. It is important to identify and define what level of quality is necessary to deliver the expected return and what that cost will be. Encompasses the business, functional, technical, and other elements that make up the project deliverables. The better these are defined, the lower the risk and the more realistic the budget and schedule can be made, offering a higher likelihood of project success. Also, by better defining the scope up front, you can better identify how changes to it impact the project budgets and time lines as it progresses. Managing scope well throughout the project life cycle empowers the business to embrace "Scope Creep" to deliver a superior solution and greater return. The greatest impact to all of these factors is the project size and its associated time and effort. The larger the project, the greater the risk, the harder it is to define the scope, the less accurate budgets and schedules may become and the more resources that may be needed. These, in turn, may impact the quality and scope. Additionally, the longer the project takes, the more the requirements and priorities may change as it progresses. This is further compounded by the rapidly and continually changing market forces on today's business. The longer a development project takes, the more likely it will fail to meet the then current needs of the business. So, the “Simple Undeniable Truth” is that the more you can reduce project size (effort, time, and investment), the greater your odds of success. But, be very cautious sacrificing quality and features to force success as it will have just the opposite effect. Surround created Accelerated Software Development and first defined it as anything that reduces effort, duration, or investment without reducing quality or scope. This remains our company's internal definition today. However, as we further defined what this meant, it was clear that our definition for quality and functionality (scope) far exceeded that of most of our customers, to their general delight. So, for our customers, Accelerated Software Development is defined as developing faster with better results and more functionality or, shortened as simply Faster, Better, More. Accelerated Software Development provides strategies to address various business technology needs along with defined processes to execute on those strategies, guidance on best practices, and a set of tools to facilitate it all. In addition, Surround can provide people to train, mentor, manage, lead, and develop. It really is all as good as it sounds. The Accelerator Development solutions are a big part of the strategies as they provide core architecture, productive user experience, and development accelerators. reclaim your evenings for sleeping. Software development struggles to keep up with the business. For most businesses today the top complaint we hear is that their software can’t keep up with the business environment. You know you need software to help you get your business where it needs to be. However, your software engineers are spending too much time dealing with multiple technology issues instead of delivering the much needed business solutions themselves. The business environment itself is changing rapidly too, and there is greater demand for software to do more and more. There is a continual flow of new devices and an increasing demand for real time integration with other services and technologies. For most businesses today, the development and delivery of key applications simply isn’t keeping pace with the business needs and businesses aren’t progressing as fast as they could if these needs were met. And, it’s only getting harder. Disruptive business models, technology advancements, mobile, cloud, social media, the changing workforce, and the empowered consumer are trends that are impacting organizations worldwide. Demand is ever-increasing for additional system capabilities, shorter release schedules, expanding peripheral connectivity, and broader application integration. All the while, decision-makers are increasingly under pressure to merge and streamline business operations, comply with evolving legal/regulatory requirements, and bring new products and services to market faster. There is a much greater demand for businesses to adapt or they will not just fall behind; eventually, they will perish. The Accelerated Software Development strategies, processes, and tools enable developers to focus on developing the business functionality rather than the technologies itself. They can create powerfully productive user experiences with well-architected software and do it very fast. Accelerated Software Development provides a streamlined, repeatable, and predictable development process from concept to deployment and well beyond. Estimates are more accurate, overall effort is significantly smaller, time lines are shorter with phased, incremental, agile deliverables. Clear expectations are set and delivered upon. People can visualize the road map with the individual phases. Accurate expectations are set and delivered on. 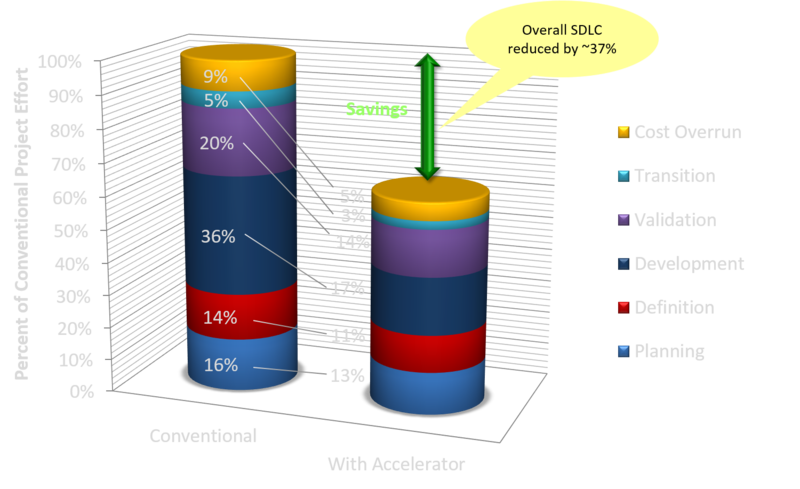 ~37%+ reduction in overall software development life cycle depending on the size and type. ~52%+ reduction in overall software development project depending on the size and type. ~80% reduction in base CRUD (read, create, update, delete) development (includes Data access layer through to web service to user interface). Reduce and Eliminate Technical Debt. The 1st pillar of Accelerated Software development is all about the user. Read about Productive User Experiences. Want to know how to quickly transform your legacy software?